Our team has thousands of clients in our database, both domestically and internationally. We tailor every marketing plan to be unique for every home, and we focus specifically on groups of buyers who are qualified and ready to purchase now! Our exposure, regardless of whether it is through print, media, web, or our intra-network international presentations, uses the most cutting edge technology tools and resources available today. We understand the importance of target marketing to the right audience, so our presentations must be at it's finest. All our print work is custom tailored, and our professional photography is presented beautifully with an artistic touch. The videography and cinematography are professionally choreographed, and our aerial team takes over the rest. For the Heart of our Marketing Plan, Please Contact Us at (714)485-3998. Nothing is better at visually explaining the relationship between the rooms in a home than a well designed floor plan. Beyond your traditional 2D floor plan, we offer the latest in 3D floor plan technology. Enter a new dimension and experience our home listings through a unique perspective never seen before. With the click of your mouse, have a virtual walk-through of our home listings! In addition, get a 360 degree panoramic view of each room, or the entire home! Click the button below to experience how our 3D Interactive tours help to showcase your home. 2D Floor Plans are simple and elegant. A home's floor plan allows anyone to quickly understand a property's dimensions, layout, and relationship of how rooms are connected in an all encompassing, easy to read, at-a-glance format. Instead of attending a standard open house, a beautifully choreographed home video can capture the essence of a home and display an online open house 24/7! A professionally designed cinematic home video tells a story. Our home videos are available on all devices, in high-definition, from the comfort of your phone, tablet, computer or TV screen. Our professional photographers use state of the art, high definition cameras to capture transcendent day time images from the interior of the home, and to showcase the exterior city, ocean, or mountain views. In addition, high exposure and low exposure shots are blended in for a more vibrant color finish. Every property is unique in it's own way, and certain properties may have an absolutely gorgeous view. For properties with a great view, we are able to capture amazing shots near sundown. The lighting during dusk is enhanced and can complement a property artistically, framed into the perfect dusk shot by our professional photographer's tools. Full scope images will take your breath away. There are some images that only the aerial view can capture. We offer our aerial photography to cover a wide area, and supply a bird's eye view of a property to fully capture the essence and scope of a home or estate. Fully choreographed by our professional team, these marvelous aerial videos are designed to grasp the full magnitude of an estate in motion from a sky view. We use nothing but the most innovative technology, and will definitely leave a lasting impression. Our virtual tours boast elegance, comprised of HD photography, with 180 to 360 degree panoramic shots, and include audio-soundtrack. For immediate property information, our listings are equipped with smart phone friendly mobile tours, QR bar codes, and much more. Scan the QR code to preview one of our many mobile tours (QR scanners are available for free on IOS and Android applications stores). 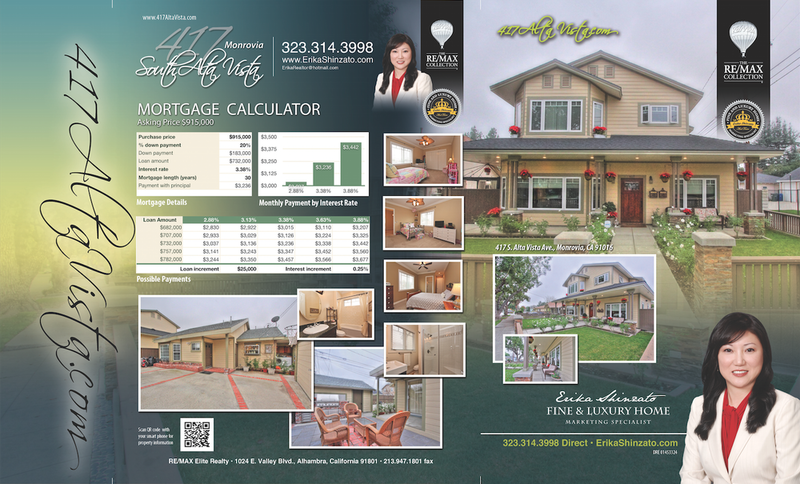 All our interior and exterior property flyers are gloss, full color, 100LB tri-fold brochures. Each are custom made & uniquely designed for each property. 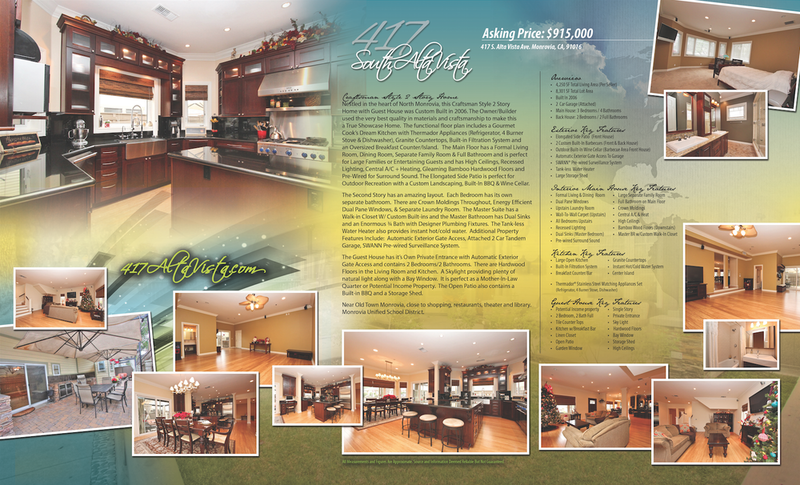 We custom design large full bleed postcards and mail it to thousands of neighboring residences. Our exposure of each property is immediate, and the quality of our presentation is at it's best. 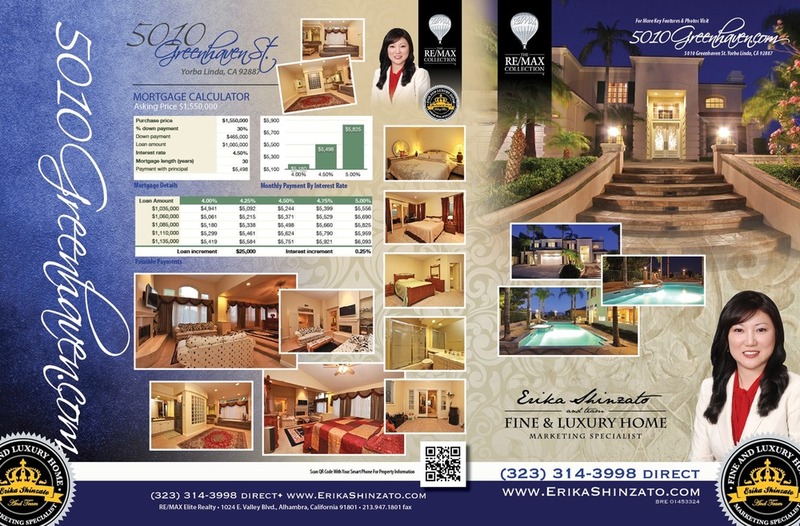 Our listings are showcased in the Erika Shinzato Homes Magazine. Our magazine is then distributed to our VIP customer database. 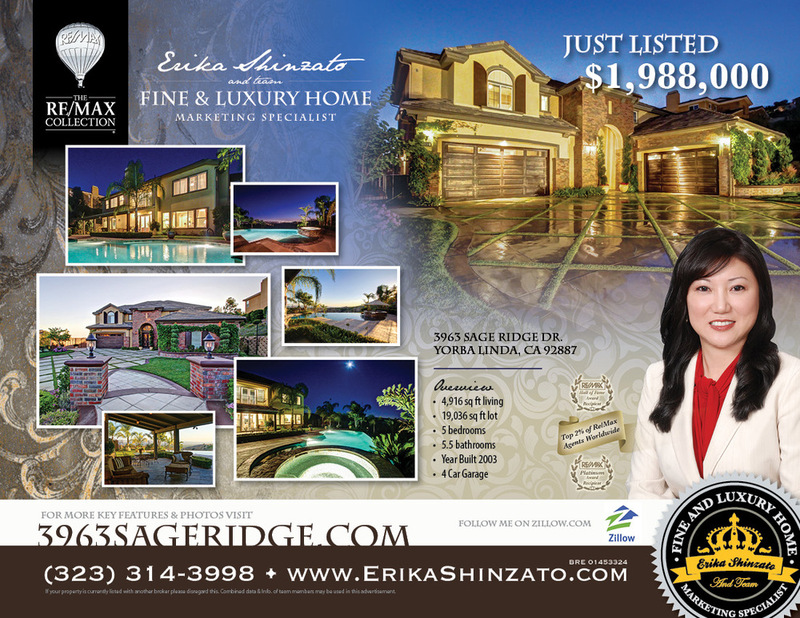 We advertise in all local and national newspaper publications which is specifically tailored to the subject property's location, as well as foreign and domestic newspapers such as Chinese Daily, Korean News, Los Angeles Times, etc. We enhance each viewer's experience with professional voice recordings. 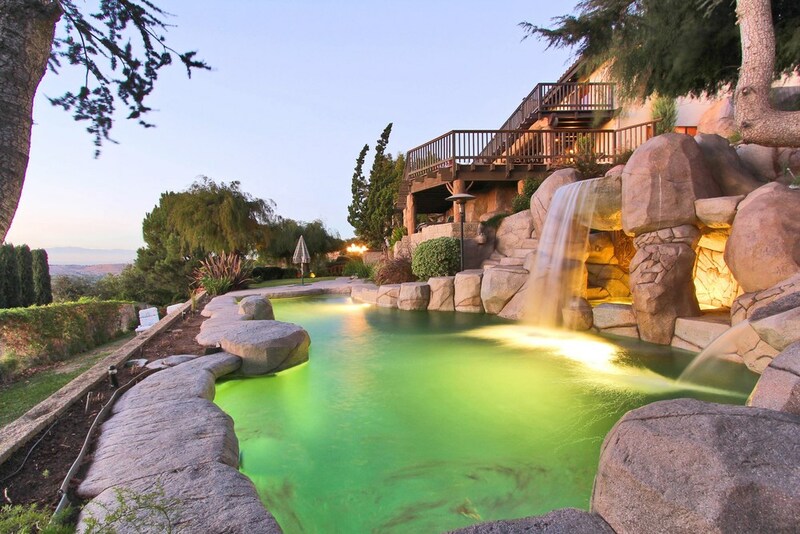 Our voice scripts highlight each property's key features and best attributes. We feature our properties on multiple sites. Once it is listed on the MLS, our properties are also exposed to hundreds of other extended websites online. In addition, our premium listings get displayed in the Re/Max Collection official site. We syndicate our listings to hundreds of sites domestically. In addition, we also promote our listings to our international networks overseas. Our sellers receive a weekly property report with comprehensive statistical data gathered about the property being sold. This is an explicit progress report to monitor a successful sale. Staged homes have a higher value and sell faster than un-staged homes. We provide professional staging services for all of our listings upon request. * Our staging services utilize professional and experienced interior designers, and sets the standard of present-day trends. Our staging company also purchases brand new accessories and furniture to showcase and present every home we list at it's very best! We use a Certified Home Staging Service who provides exquisite appeal to our homes. 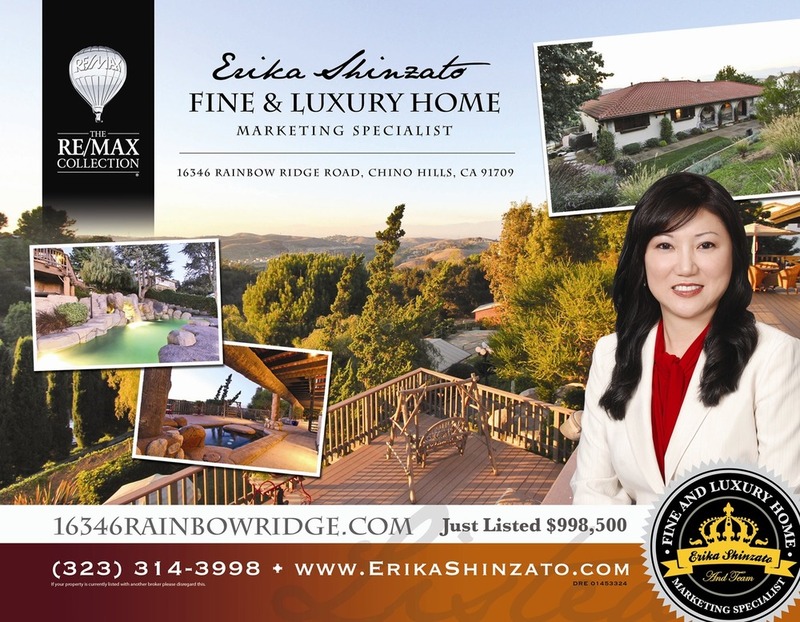 In addition to being a realtor®, Erika Shinzato is also a Certified Staging Agent (CSA), who will use her experience to highlight and enhance a property's unique features, and utilize the space to maximize a home's potential. *Certain terms and conditions apply. Ask for details.